Have you ever read a Choose-Your-Own-Adventure book? One where you have to decide what your character will do in various situations, with many different possible endings to the story? I haven’t written a book for the CYOA brand, but I DID write a book with lots of choices and endings built into it. 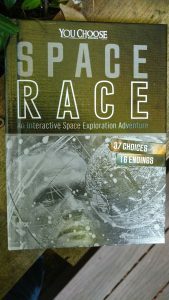 It’s called Space Race, and it’s part of a history series called You Choose, in which readers have to guide their characters through events that really happened. Space Race tells the stories of three characters I invented–an American engineer, an American woman pilot, and a Russian cosmonaut–at the dawn of space exploration, when two superpowers were racing to be the first in space, first in Earth orbit, and first on the Moon. Each of these characters dreams of exploring the new frontier of outer space, and each faces challenges and life-changing decisions. The events of Space Race really happened. Only my characters are fictional. It was a blast to research the early years of space exploration and find ways to place my invented characters inside that thrilling world–and also to make the giant diagram I needed to keep the many decisions and endings sorted out! If you read Space Race, let me know what you think.